In 2012, Pro Se Productions, a Publisher of New Pulp and Genre Fiction, began the Pulp Obscura imprint in conjunction with Altus Press, a renowned publisher of quality reprints of Classic Pulps and New Pulp as well. Pulp Obscura is a line of anthologies and books that featured classic, often forgotten pulp characters in new tales by today’s best writers. Pro Se proudly announces the release of the latest volume in this line, one featuring the return of a character from the creator of Zorro- The New Adventures of the Man in Purple! Created by Johnston McCulley, the man who brought Zorro to life, The Man in Purple is Richard Staegal, a wealthy man-about-town with a colorful past. Donning a purpled mask and suit, Staegal leads a life of outrageous adventure stealing from the rich and ruthless and giving the spoils away to the powerless people who are unable to fight for themselves. 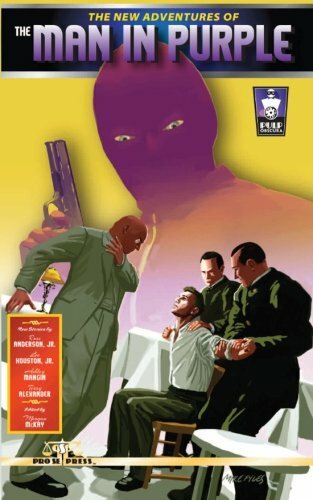 Join The Man in Purple in exciting new stories of Thrilling Capers by authors Russ Anderson, Jr., Lee Houston, Jr., Ashley Mangin, and Terry Alexander! Follow the masked man as he takes on new adventures with his nemesis, the intrepid Detective Troman hot on his trail! Bar your windows and lock your doors, but if you’re his target, nothing will stand in the way of the The Man in Purple in his pursuit of justice and adventure! From out of the Past comes new tales of The Violet Vigilante! Featuring the fantastic artwork of Mike Fyles, The New Adventures of The Man in Purple is available on Amazon and at Pro Se’s own store at http://tinyurl.com/mqq7u7k for $12.00 in a print edition formatted and designed by Sean Ali. Pulp Obscura Presents The New Adventures of The Man in Purple! Also, thrill to the original adventures of The Man in Purple with the beautifully designed reprint volume available from Altus Press http://www.altuspress.com/shop/the-man-in-purple/ in both digital and print editions. For digital copies for review, interviews with the authors or more information on this title, contact Morgan McKay, Pro Se’s Director of Corporate Operations, at directorofcorporateoperations@prose-press.com.